Various physical (laser) and chemical root conditioning agents (citric acid, phosphoric acid, tetracycline hydrochloride [HCl], doxycycline HCl, fibronectin, ethylenediaminetetraacetic acid [EDTA], minocycline HCl, hydrochloric acid, Cohn's factor, sodium deoxycholate etc.) have been tried following root instrumentation, to enhance new attachment. ,,,,,, These agents expose dentin collagen and cementum bound proteins and have been found to elute retained toxins from the altered root surfaces. Such treatment enlarges dentinal tubules into which healing connective tissue can enter. Thus, root conditioning has been recommended as an adjunct to mechanical root surface debridement. EDTA has been extensively tried as a root conditioning agent. It appears to promote early cell tissue colonization by promoting a more biocompatible surface for cell and tissue attachment. EDTA seems preferable to citric or phosphoric acid because EDTA will selectively remove hydroxyapatite, leaving most of the collagenous matrix intact, whereas cleaning with conventional etching agents such as citric or phosphoric acids will, in addition to dissolving the mineral, also dissolve the collagenous matrix. The tetracyclines are broad spectrum antimicrobials that are used for root conditioning. When applied on root-planed dentin, tetracycline removed the smear layer, exposed the dentinal tubules and produced a fibrillar surface. ,,, Tetracycline HCl demineralized dentin has been shown to demonstrate substantivity. Dentin root surface demineralization by low pH tetracycline increases fibronectin, an extracellular matrix glycoprotein, binding. The absorbed or bound fibronectin enhances fibroblast attachment and growth while suppressing epithelial cell attachment and growth. The aim of the present study was to compare the efficacy of EDTA and tetracycline HCl as root conditioning agents on planed root surfaces. For the present study, 20 human maxillary anterior teeth indicated for extraction due to chronic periodontitis were collected from the patients visiting the Department of Periodontology and Oral Implantology, Guru Nanak Dev Dental College and Research Institute, Sunam. Teeth with hopeless prognosis due to periodontal disease. No history of periodontal treatment for the past 6 months. Teeth with vital pulps and no root surface caries or restorations. Absence of any endodontic treatment. Absence of internal or external root resorption. The agents used were EDTA (10% with pH 4.7) and tetracycline HCl (10% with pH 2.2). Both solutions were made by mixing 1 g of EDTA/tetracycline HCl powder to 10 ml of distilled water and constantly stirring with a glass rod, till the powder got fully dissolved. The pH was tested using a pH meter. After extraction, the teeth were cleaned of blood and saliva with distilled water using a soft bristled brush. After rinsing, the root surfaces were thoroughly root planed with Gracey curette (No. 1/2) followed by finishing bur (No. 102R) in high-speed hand piece at a speed of approximately 400,000 rpm in an attempt to remove the cementum and achieve a smooth, hard glass like surface. Experimental surface was obtained by removing the crown of each tooth at the level of cemento-enamel junction (CEJ) and then a portion of root 5 mm from the CEJ was taken up. A longitudinal section of the obtained specimen along the pulp chamber was made in order to obtain two equal halves with the help of a double-sided diamond disc in a slow-speed hand piece under copious water irrigation. The pulpal side was flattened with a straight bur and a horizontal groove was made for identification purpose. A total number of 40 specimens were prepared from extracted maxillary anterior teeth which were divided into two groups comprising of 20 specimens in each group. Group II: Dentin specimens treated with Tetracycline HCl solution for 3 min. The dentin samples were rubbed with saturated cotton pellets of the test solutions by "Active Burnishing Technique" with the help of tweezers for 3 min, which were changed every 30 s so as to maintain a steady concentration. After acid treatment the area was rinsed for 2 min with distilled water. 4 = Complete removal of the smear layer with clean and open dentinal tubules. Total number of dentinal tubules present per specimen. Number of patent dentinal tubules from the total number of tubules present. Diameter of randomly selected ten patent dentinal tubules was measured using a digital vernier caliper with 0.03 mm accuracy. In both the experimental groups, the efficacy in removal of smear layer was near total except for few areas, which were covered by debris, the difference between the two groups being statistically insignificant [Table 1]. In Group I (EDTA), the range came out to be 2-4 with a mean of 2.95 and standard deviation of 0.394 [Table 2], [Figure 1]. In Group II (tetracycline HCl), the range was found to be 2-4 with mean of 2.85 and standard deviation of 0.670 [Table 2], [Figure 1]. It was observed that the total number of dentinal tubules in the experimental Group II were more when compared to the experimental Group I, the difference being statistically highly significant (P < 0.05) [Table 3]. The total number of dentinal tubules in 20 specimens of Group I amounted to 1211 and in case of Group II, the total count was found to be 1997. In case of Group I, the range was 44-82 with a mean of 60.5 and standard deviation of 9.9 [Table 4], [Figure 2]. In Group II, the range was 62-123 with a mean of 99.8 and standard deviation of 16.2 [Table 4], [Figure 2]. It was observed that the number of patent dentinal tubules in the experimental Group II was more when compared to the experimental Group I, the difference being statistically highly significant (P < 0.05) [Table 5]. The number of patent dentinal tubules in 20 specimens of Group I was 760 and in case of Group II, the count was found to be 1010. In case of Group I, the range was 20-60 with a mean of 38.0 and standard deviation of 8.0 [Table 6], [Figure 3]. In Group II, the range was 30-67 with a mean of 50.5 and standard deviation of 10.6 [Table 6], [Figure 3]. In the experimental Group I, the diameter of selected ten patent dentinal tubules was more as compared to the experimental Group II [Table 7]. In case of Group I, the range was 2.87-5.32 (mm) with a mean of 4.26 and standard deviation of 0.558 [Table 8], [Figure 4]. In Group II, the range was 2.16-5.64 (mm) with a mean of 3.19 and standard deviation of 1.064 [Table 8], [Figure 4]. The difference in the diameter of selected ten patent dentinal tubules came out to be statistically highly significant (P < 0.05). Considering the above findings, an effort was made in this study to compare the surface characteristics of diseased root surfaces after application of 10% EDTA and 10% tetracycline HCl as root conditioning agents using SEM. After conditioning with respective solutions, the specimens were then processed and examined under SEM at ×1500 magnification to evaluate: Efficacy in removal of smear layer, total number of dentinal tubules present per specimen, number of patent dentinal tubules and their diameter. However, the findings of the present study are not in accordance with the findings of Babay who showed similar results with EDTA and tetracycline HCl as root conditioning agents on periodontally involved root surfaces. Both the agents removed the smear layer and exposed the dentinal tubules equally. 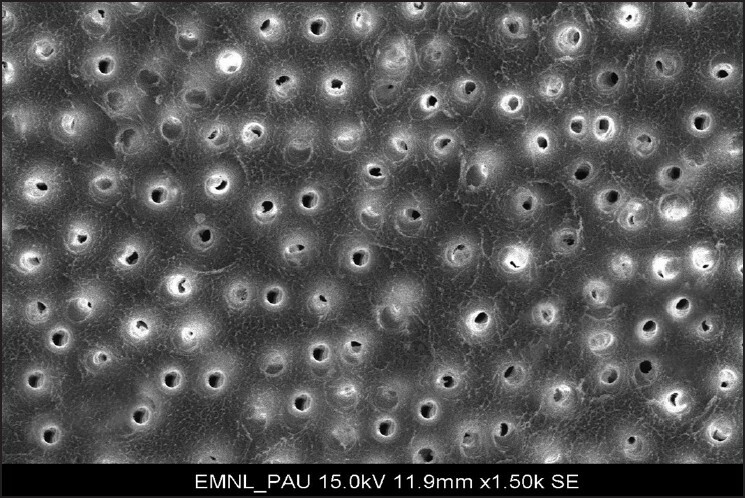 The mode of application may have caused these observations since they used light pressure technique without burnishing and also they used 8% EDTA. In the present study, we used the active burnishing technique and 10% EDTA, giving different results. In the present study, it was found that root conditioning in both the experimental groups helped in the removal of smear layer, exposure of dentinal tubules and also widening of dentinal tubules. Hence, their application as root conditioner might have a significant role in periodontal wound healing and futuristic new attachment in vivo. The results of this study are limited to the physical findings of root surface changes and do not present in vivo differences that may result from the physiologic effects of EDTA or tetracycline HCl. 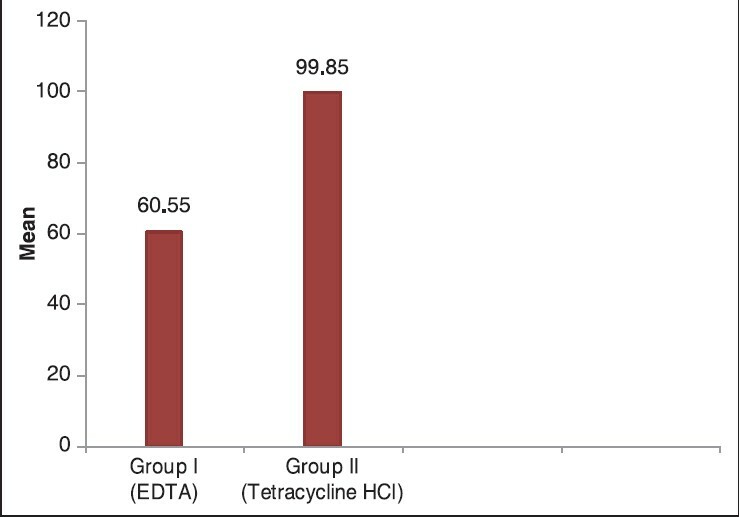 Both EDTA and tetracycline HCl were equally effective in removing the smear layer. There was no statistical significant difference (P > 0.05) between the two groups. Both test solutions resulted in exposure of the dentinal tubules. 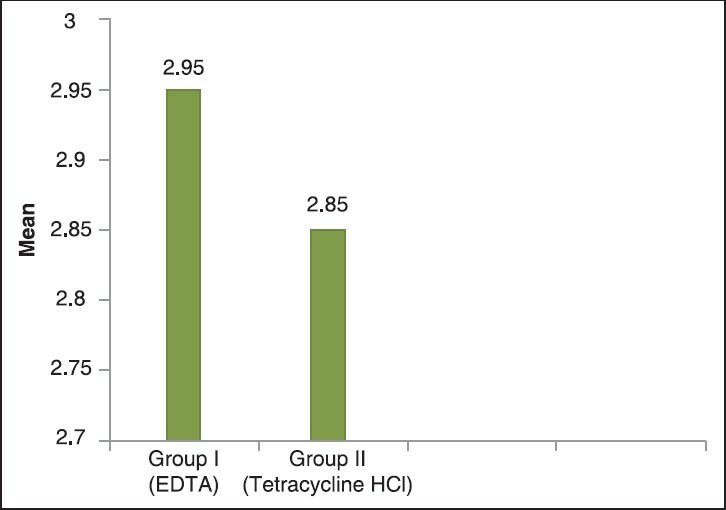 The results of the tetracycline HCl [Figure 5] were highly significant (P < 0.05) as compared to EDTA [Figure 6]. 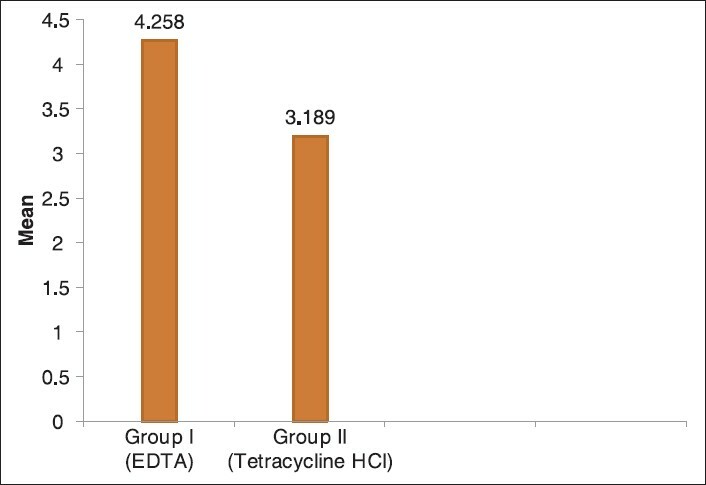 The number of patent dentinal tubules exposed by tetracycline HCl were statistically high (P < 0.05) when compared to EDTA. Both the experimental groups resulted in widening of the patent dentinal tubules, but the results of EDTA were highly significant (P < 0.05) for mean diameter of randomly selected 10 patent dentinal tubules as compared to tetracycline HCl. 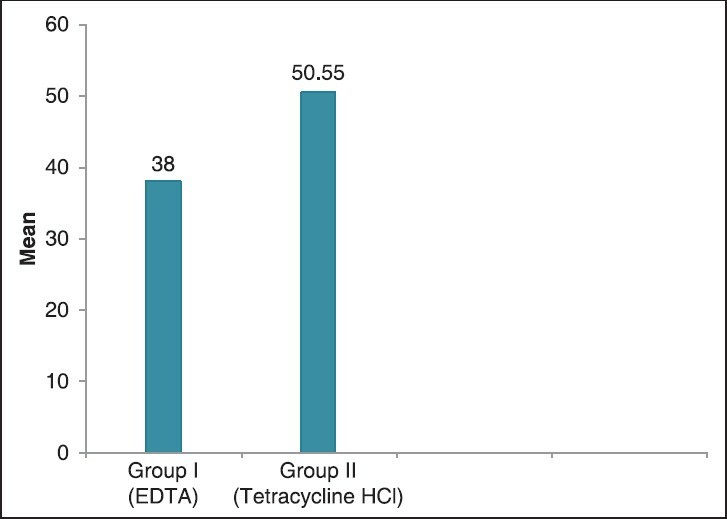 Although tetracycline HCl was more efficient in exposing the dentinal tubules, EDTA was much more effective as root conditioner because it enlarged the diameter of dentinal tubules more than that of tetracycline HCl. In view of the present findings, further studies are necessary to establish the in vivo importance of EDTA and tetracycline HCl application as root conditioners as an additional step during periodontal therapy, especially in regenerative procedures. 1. Blomlöf JP, Blomlöf LB, Lindskog SF. Smear removal and collagen exposure after non-surgical root planing followed by etching with an EDTA gel preparation. J Periodontol 1996;67:841-5. 2. Hanes PJ, O'Brien NJ, Garnick JJ. A morphological comparison of radicular dentin following root planing and treatment with citric acid or tetracycline HCl. J Clin Periodontol 1991;18:660-8. 3. Jones WA, O'Leary TJ. The effectiveness of in vivo root planing in removing bacterial endotoxin from the roots of periodontally involved teeth. J Periodontol 1978;49:337-42. 4. Terranova VP, Franzetti LC, Hic S, DiFlorio RM, Lyall RM, Wikesjö UM, et al. A biochemical approach to periodontal regeneration: Tetracycline treatment of dentin promotes fibroblast adhesion and growth. J Periodontal Res 1986;21:330-7. 5. Wirthlin MR, Hancock EB. Chemical treatment of diseased root surfaces in vitro. J Periodontol 1981;52:694-6. 6. Hanes PJ, Polson AM, Frederick GT. Initial wound healing attachments to demineralized dentin. J Periodontol 1988;59:176-83. 7. Iþik G, Ince S, Saðlam F, Onan U. Comparative SEM study on the effect of different demineralization methods with tetracycline HCl on healthy root surfaces. J Clin Periodontol 1997;24:589-94. 8. Urist MR. Bone histogenesis and morphogenesis in implants of demineralized enamel and dentin. J Oral Surg 1971;29:88-102. 9. Misra V, Mehrotra KK, Dixit J, Maitra SC. Effect of a carbon dioxide laser on periodontally involved root surfaces. J Periodontol 1999;70:1046-52. 10. Urist MR, Nogami H. Morphogenetic substratum for differentiation of cartilage in tissue culture. Nature 1970;225:1051-2. 11. Mythili R, Ahamed BR. Efficacy of tetracycline hydrochloride and doxycycline hydrochloride as a root conditioner - A scanning electron microscopic study. J Indian Soc Periodontol 2006;10:227-32. 12. Register AA. Bone and cementum induction by dentin, demineralized in situ. J Periodontol 1973;44:49-54. 13. Wirthlin MR, Hancock EB. Biologic preparation of diseased root surfaces. J Periodontol 1980;51:291-7. 14. Wikesjö UM, Claffey N, Nilvéus R, Egelberg J. Periodontal repair in dogs: Effect of root surface treatment with stannous fluoride or citric acid on root resorption. J Periodontol 1991;62:180-4. 15. Lafferty TA, Gher ME, Gray JL. Comparative SEM study on the effect of acid etching with tetracycline HCl or citric acid on instrumented periodontally-involved human root surfaces. J Periodontol 1993;64:689-93. 16. Blomlöf J, Jansson L, Blomlöf L, Lindskog S. Root surface etching at neutral pH promotes periodontal healing. J Clin Periodontol 1996;23:50-5. 17. Labahn R, Fahrenbach WH, Clark SM, Lie T, Adams DF. Root dentin morphology after different modes of citric acid and tetracycline hydrochloride conditioning. J Periodontol 1992;63:303-9. 18. Trombelli L, Scabbia A, Zangari F, Griselli A, Wikesjö UM, Calura G. Effect of tetracycline HCl on periodontally-affected human root surfaces. J Periodontol 1995;66:685-91. 19. Sterrett JD, Simmons J, Whitford G, Russell CM. Tetracycline demineralization of dentin: The effects of concentration and application time. J Clin Periodontol 1997;24:457-63. 20. Lowenguth RA, Blieden TM. Periodontal regeneration: Root surface demineralization. Periodontol 2000 1993;1:54-68. 21. Borghetti A, Mattout P, Mattout C. How much root planning is necessary to remove the cementum from the root surface? Int J Periodontics Restorative Dent 1987;7:23-9. 22. Polson AM, Hanes PJ. Cell and fiber responses to cementum from periodontitis-affected root surfaces after citric acid treatment. J Clin Periodontol 1989;16:489-97. 23. Isik AG, Tarim B, Hafez AA, Yalçin FS, Onan U, Cox CF. A comparative scanning electron microscopic study on the characteristics of demineralized dentin root surface using different tetracycline HCl concentrations and application times. J Periodontol 2000;71:219-25. 24. Frantz B, Polson A. Tissue interactions with dentin specimens after demineralization using tetracycline. J Periodontol 1988;59:714-21. 25. Babay N. Comparative SEM study on the effect of root conditioning with EDTA or tetracycline Hcl on periodontally involved root surfaces. Indian J Dent Res 2000;11:53-7. 26. Lasho DJ, O'Leary TJ, Kafrawy AH. A scanning electron microscope study of the effects of various agents on instrumented periodontally involved root surfaces. J Periodontol 1983;54:210-20. 27. Register AA, Burdick FA. Accelerated reattachment with cementogenesis to dentin, demineralized in situ. II. Defect repair. J Periodontol 1976;47:497-505. 28. Sterrett JD, Murphy HJ. Citric acid burnishing of dentinal root surfaces. A scanning electron microscopy report. J Clin Periodontol 1989;16:98-104. 29. Madison JG 3 rd , Hokett SD. The effects of different tetracyclines on the dentin root surface of instrumented, periodontally involved human teeth: A comparative scanning electron microscope study. J Periodontol 1997;68:739-45. 30. Blomlöf L, Jonsson B, Blomlöf J, Lindskog S. A clinical study of root surface conditioning with an EDTA gel. II. Surgical periodontal treatment. Int J Periodontics Restorative Dent 2000;20:566-73. 31. Lee JY, Seol YJ, Park JR, Park YJ, Chung CP. Biological effects of a root conditioning agent for dentin surface modification in vitro. J Periodontal Implant Sci 2010;40:257-64. 32. Gamal AY, Mailhot JM. 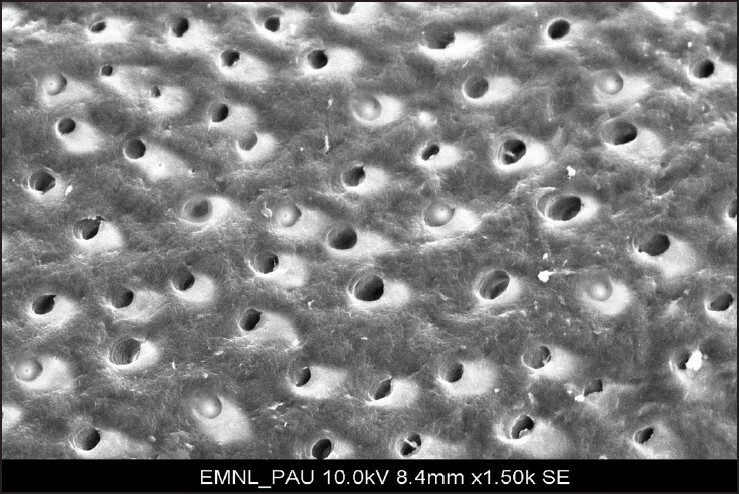 The effects of EDTA gel conditioning exposure time on periodontitis-affected human root surfaces: Surface topography and PDL cell adhesion. J Int Acad Periodontol 2003;5:11-22.